Personalized Oval Pill Boxes Custom Printed in Bulk or Blank. Promotional, Economy. Lowest prices in America. 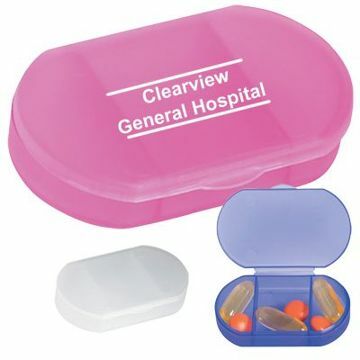 Bulk discount oval pill boxes with 3 compartments, custom imprinted with your logo or message. We also supply wholesale blank (not custom imprinted) pill boxes for only $0.39 each (minimum 250). 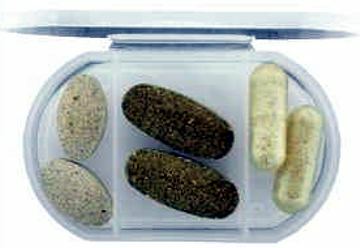 Budget Prices in the USA and Canada for wholesale oval pill boxes. American clients pay no taxes, Canadian clients don't pay PST. We will send you a proof for your approval before production. Price includes a 1 color, 1 side imprint. Set up charge is $40.00 per color. Setup Charge: $40.00 per color. No Setup Charge for repeat orders. COLORS AVAILABLE Frosted: Blue, Clear or Pink. PACKAGING Cello Bag, 500 per carton @ 10 lbs. TYPICAL PRODUCTION TIME: 7 days after art approval; contact us for faster delivery; blank oval pill boxes ship next day.